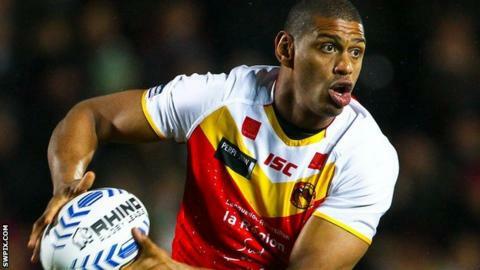 Catalan Dragons eased into the fifth round of the Challenge Cup with a convincing win against fellow Super League strugglers London Broncos. Leon Pryce, Louis Anderson and Thomas Bosc crossed for Catalan before London hit back through Denny Solomona. Antoni Maria, Daryl Millard, Morgan Escare and another Anderson try after the break put the result beyond doubt. Tries for Mason Caton-Brown, Iliess Macani and a late Nick Slyney effort added respectability to the result. The Broncos are now winless in eight games in all competitions at the start of the season, while the French club have won two of their last three matches. Pryce first latched onto a clever Ben Pomeroy knock back from a Bosc kick to touch down under the posts on four minutes, before playing a part in tries for Anderson and Bosc. Solomona claimed a high Josh Drinkwater bomb to make it 16-6 before the break, but any hopes of a fightback were extinguished as Millard and Maria both crossed inside the first 10 minutes of the second half. Anderson then got on the end of a Bosc chip kick to spin over the line for his second try. Drinkwater orchestrated London's response, sending both Caton-Brown and Macani over. While Escare dummied to add the Dragons' seventh try in a comprehensive display, Slyney raced away to score a consolation for the Broncos with the final play of the game. "The most important thing tonight is that we won and, as you say in England, a win is a win. "It wasn't pretty, but we are through to the next round and we are happy with that. "It is never easy against London. Even if you look at a result and they have lost by 50, you know they have been tough to beat and that it wasn't easy, it will never be easy against London." "It's not often in rugby league that you will score 24 points and get beat, but that's probably where the London Broncos are at the moment. "There was a period in the second half where the Catalans scored three back-to-back tries, which really hurt us. That probably shows where the Catalan Dragons are too. "They've played particularly well in the last four weeks and that was probably typified by us scoring 24 points, yet still not winning the game." Catalan Dragons: Escare; Oldfield, Pomeroy, Duport, Millard; Pryce, Bosc; Elima, Pelissier, Lima, Taia, Anderson, Baitieri. Replacements: Maria, Paea, Garcia, Guasch. London Broncos: Solomona; Macani, Caton-Brown, Minns, O'Callaghan; Farrar, Drinkwater; Greenwood, Moore, Slyney, Vea, Cook, Foster. Replacements: Krasniqi, McMeeken, Bishay, Griffin.